From Thanksgiving until New Year's Eve, Nashville offers tons of festive opportunities during the Holiday Season. There is an unlimited supply of Holiday events and Christmas Happenings for groups to enjoy during the holiday season. One of the best display of Holiday Lights in the country happens at the Gaylord Opryland Resort in Nashville, during their annual "A Country Christmas" celebration. 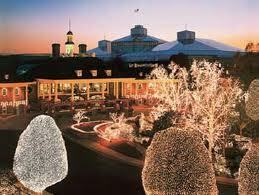 The entire Gaylord Opryland Complex turns into a Winter Wonderland bustling full of entertainment and activities for groups of all ages. Your tour can include viewing their spectacular holiday lights, Nashville Nightlife Theatre dinner, Radio City Rockettes Christmas Spectacular, ICE! to browsing through the Treasures for the Holidays Craft Show. It is four weeks of non-stop holiday fun! 3 hour guided Nashville City Tour - see historic downtown, including 2nd Avenue, the Parthenon, Bicentennial Mall, East Bank, World War II Memorial, Music Square and a few minutes free time at the Honky Tonks on Broadway as well as at Nashville Visitor's Center. Guided tour of Opryland, all decorated for the holidays with over 2 million lights, miles of ribbon and garland, hundreds of poinsettias all under glass in over 8 acres of gardens! Two nights accommodation at a 3-star, AAA rated Nashville hotel, Luggage Service. Nashville Nightlife Theatre. Your guests will enjoy "The Best of Country Holiday Show", voted Music Valley's #1 Dinner show. Featuring a celebration of the Holidays done up Country Style. You will hear many of the greatest Country and Spiritual Holiday songs from the stars of yesteryear and today, including Tennessee Christmas, White Christmas, I'll Be Home for Christmas and many more. Tour of the Ryman Auditorium (The Grand Ole Opry) From 1943-74, the auditorium was home to the Grand Ole Opry. Pioneering performers such as Hank Williams, Bill Monroe, and Patsy Cline helped shape country and bluegrass music from the Ryman stage. Designated a National Historic Landmark in 2000, the Ryman was named Theater of the Year for both 2003 and 2004. Belle Meade Plantation where you can you experience the sights, sounds and smells of Christmas in this beautiful historic setting. When you tour the Mansion, you walk right into the rooms as if you were a guest in the 1800's. There are no velvet ropes, no glass walls to separate you and our collection. Costumed guides willingly share the stories surrounding the rise and fall of the Harding and Jackson Family. seating based on availability at time of booking.